It’s not perfect yet. I’ve got to keep the red and black steek stitches in at least by one stitch, so they don’t peek through when the button band stitches are picked up, and the button bands need to be slightly narrower, but it’s a good start. 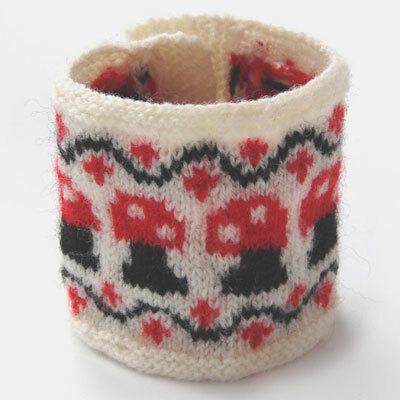 The buttons, stolen from the ill-fitting neck warmer part of the Highland Norsk sweater, are PERFECT on this. I fretted and fretted all through the knitting that they would be too large, but they look great. I got the buttons at Bea Ellis Knitwear (A++ service), but they have more styles here (I’ve never shopped there). If you have, let me know. I’m sure I need more troll buttons, now that I’ve used these. Pattern to come, so find some buttons! Completely in love with this one! You are such a freaking GENIUS! this is fab! colors all work, the buttons are awesome! don’t worry about the tiny bit showing (even with glasses, I hardly see it), the fabric is dynamic and will shift some- its perfect. I have a special place in my heart for mushroom stuff- maybe too much Mario Brothers as a kid? Oh, it’s very cute! I love all things mushroom/toadstool. Makes me think of Alice in Wonderland, actually. BEK’s customer service is excellent–emails are answered immediately. You could probably call them. Get a color card, best way for colors. That is incredibly cute, and quite inspiring. That’s awesome! I LOVE cute little mushrooms and trolls. This would be a perfect coffee cup warmer…hmmmm. And thanks for the button resource. The mushrooms are great and the buttons even better! those buttons are so cute! I looked at them for a minute trying to figure out what they were! I meant to comment on this yesterday — love it, Adrian! Love the pattern + the buttons! So cute. 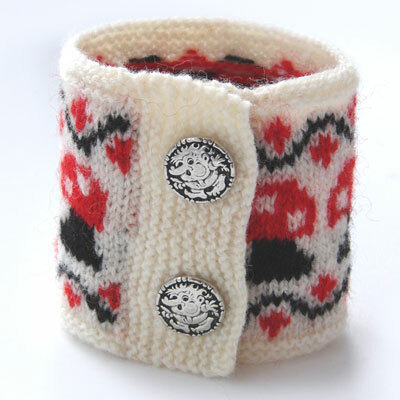 The cutest wrist warmers I’ve ever seen…and those buttons!!! Never was there a better marriage between button and knitted item. Brava! The perfect mix of button and design! I’m with Loribird above, the buttons would be great on a baby sweater, but then, so too would be the mushrooms! The only problem would be choosing whether the mushrooms would be best in red, brown, or green, or maybe even white on another color. I love that! The buttons are just right with the mushrooms. Trolls and shrooms! How nifty is that? I love it! so cute and stylish! I love the colors! The mushrooms are terrific. I love them. I could imagine this motif on a baby sweater. And troll buttons – awesome!